Those of us who live in Scotland are almost uniquely fortunate in this crowded world in that we possess wild land aplenty in which to engage in the act of journeying. Our reserves are increasingly under threat from development, but for now there many areas where one can go with a reasonable expectation of passing a few days in complete solitude, without setting eyes on another soul. 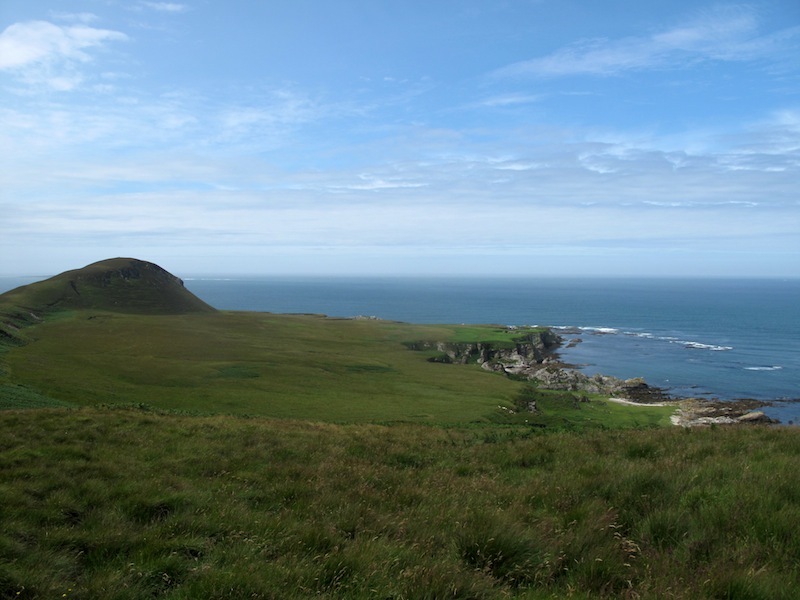 The roadless tracts of Islay’s north eastern tip are one such place. 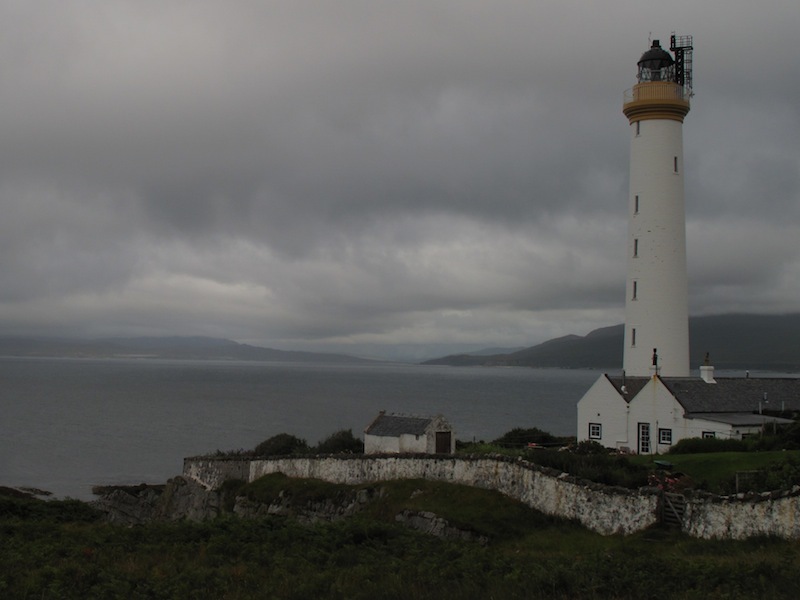 The coast facing the sound of Jura is uninhabited north of the ferry port of Port Askaig, save for the distillery settlements of Caol Islay and Bunnabhainn and the lighthouse keeper’s cottage at the point of Rhuvaal. As always before a trip to the islands I took my well-worn copy of WH Murray’s ‘The Hebrides’ from the bookshelf to see what the great man had written about the place. To my surprise his otherwise exhaustive survey had neglected this corner of Islay, lending a pleasing a feeling of exploration to the outing. A faint argo track follows the path of the power line from Bunnabhainn to the lighthouse. Beyond lay the feature that had drawn me, the north facing sands of Bagh an Da Dhoruis, where I planned to make a camp from which to explore the caves and bays of the uninhabited north coast. The rain, which had fallen heavily throughout the crossing from Kennacraig and the cycle to Bunnabhainn, began to ease as I walked the coast and had stopped completely by the time I paused at the incongruous, isolated telegraph pole that marked the start of the easiest passage through crags of shattered limestone down to the stranded stacks and great arches of the bay. The pole was a true telegraph pole of the type that were replaced 20 or 30 years ago and which are now found only in the remotest of outposts, with three cross bars at the top, each holding four ceramic insulators. I can only imagine that it is the lone survivor of a line that once connected the islands of Oronsay and Colonsay, some half dozen or so miles to the north, to the mainland via a subsea cable. Surprised to spot a bothy further up the coast, I checked my map. Sure enough, I picked out an ambiguous square feature of the type that might signify a house, a ruin or a large boulder that had passed unnoticed on previous inspections. Hunkering down, I reached for my monocular so as to conduct a more careful inspection. Scanning the foreshore only rocks were visible, but when I removed the glass from my eye the bothy returned. I was looking onto the corner of the building and could clearly see the gable end and the roof, complete with chimney. So convincing was the illusion that I alternated between glass and naked eye several times until I was sure that my eyes had indeed deceived me. The bay rests within an amphitheatre of steep limestone crags. 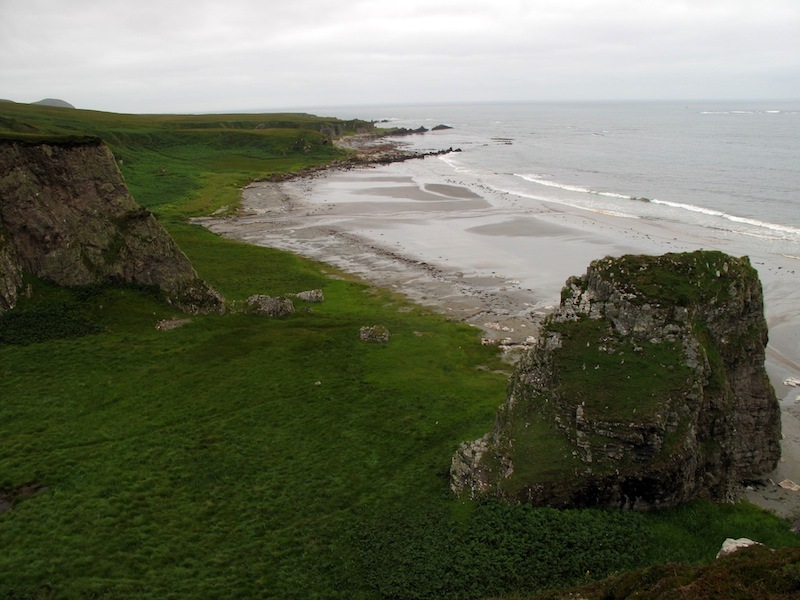 Between the crags and the sea lay a raised foreshore, the boggy ground of which supported verdant grasses, swaying gently at the peak of summer growth. A swell was running. The resulting waves folded themselves parallel to the kilometre of westward stretching sand. The afternoon’s rain, peat-stained to a deep auburn, thundered from the moorland above in foaming cataracts and fibrous trickles. A pyramidal stack of limestone reared up from the grass, presenting a shear face seawards. As I picked my way down towards the bay I felt I was entering a lost world. If a mirror had replaced the broad Atlantic views to the north I would have been descending into a crater. Echoes from the cataracts and the surf echoed off the cave-lined cliffs, providing a disorientating, swirling soundscape, often completely out of sync with visual input. More than once I heard what sounded like human cries within this tapestry of sound. All in all the place possessed an atmosphere which I savoured as I walked along the sand, periodically pausing to inspect likely camp spots.Two thirds of the way along the sand I left the intimidating, wet atmosphere of the amphitheatre and rounded a small headland with a dry cave near its top to find a large expanse of classic raised beach. The goat-cropped machair was studded with purple thistles. The grass was broken in places by stranded shores of cobble sized stones. A volcanic dyke extended its arm offshore and the waves struck it with explosive force. The slopes separating this from the upper moor were both smaller and less steep than those of the amphitheatre, leading to less reflected sound and a more restful ambiance. I pitched up and set about preparing coffee then dinner, passing the evening in meditative contemplation, drinking in the scene with all my senses. Far offshore the surf broke over hidden reefs. I watched as the evening light picked out the small hills and duns of Colonsay and Oronsay, triggering memories of a sunny May week spent exploring the beaches and small hills of the finest and most compact of all the Hebridean islands. To the west, beyond the jagged crests of the Post Rocks, lay the open Atlantic. 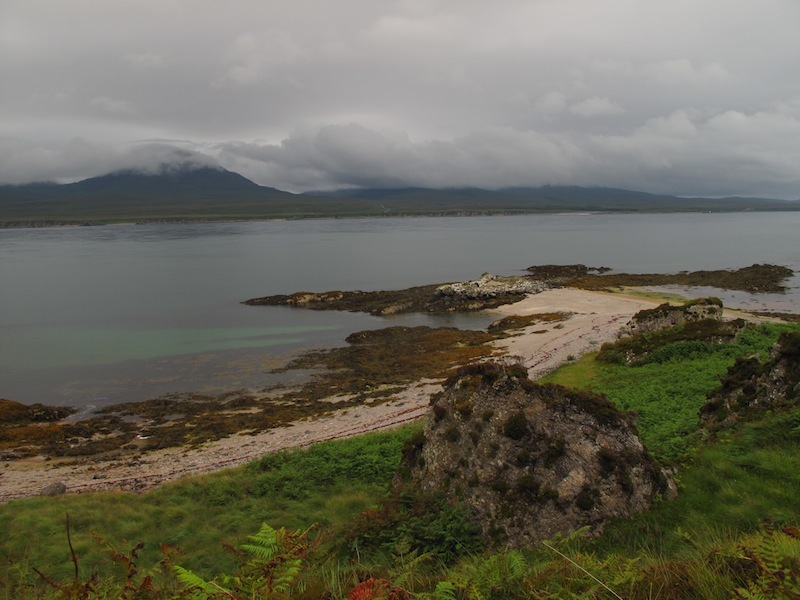 The indented coast of Jura stretched eastwards, its raised beaches of melon sized quartzite rocks reduced to pastel strokes in the flat light. Beyond its tip the dark pyramid of Scarba squatted above the foaming waters of the Gulf of Coryvreckan. The geology hereabouts provides insight into the climate of the distant past. The most striking rock is the quartzite whose white blocks comprise the Paps of Jura and also the higher summits of Islay. Similarity of appearance and geographical proximity might lead one to assume that it was formed, like the quartzite of the Northwest, in Cambrian times. But it is in fact more than one hundred million years younger, part of the Dalradian rocks that make up much of the Southern Highlands between the Highland Boundary Fault and the Great Glen Fault. The signature rock type of the Dalradian is a contorted, slatey mica-schist, but it also contains fine sandstones (quartzite), limestones and, most interestingly, tillites. Till is the mix of rock fragments and soil that is left behind in the wake of glaciers. Indeed much of the soil of Scotland can be described as a glacial till formed during the most recent ice age. Just as sand becomes sandstone, till becomes tillite, and that is what is found in the vicinity of Port Askaig, evidence of a past glaciation between 700 and 600 million years ago, when Scotland was located close to the equator. The formation of such glacier-milled soil near the equator has been taken as evidence of ‘Snowball Earth’, one of several episodes in the distant geological past where the planet has been almost completely encased in ice from poles to equator. Beneath this icy blanket, volcanic processes continued unabated, locally melting the ice and spewing carbon dioxide into the atmosphere. With the oceans hidden there was no means by which this greenhouse gas may be removed from the atmosphere and it continued to build up, retaining the sun’s heat until the temperature increased sufficiently to melt the ice, thus freeing the planet from its frigid strait-jacket and raising sea levels such that the glacial till was submerged in shallow seas. In the warming climate water vapour evaporated from the ice-free ocean surface to form rain clouds. The rain scrubbed the carbon dioxide from the atmosphere to form acid rain which fell onto a landscape of bare shattered rock and soil exposed by the retreating ice. As the acid rain reacted with this landscape it carried the carbon into the oceans where it precipitated as limestone. Such limestones occur worldwide above Snowball Earth tillites and are known as cap carbonates. The Bonahavon limestone, of which the north coast of Islay is composed, is generally believed to be an example of a cap carbonate. The pounding surf lulled me to sleep after a three course dinner of soup, re-hydrated chilli and couscous and Angel Delight. I awoke to a bright day. The tide was out and the sea calm. My regret at not having fully savoured the rhythm of the waves was momentary, for when I removed my earplugs the otherworldly sound of seal song reached me. Out on the exposed rocks they were basking in the sun and communicating with one another in highly varied melodic bursts. 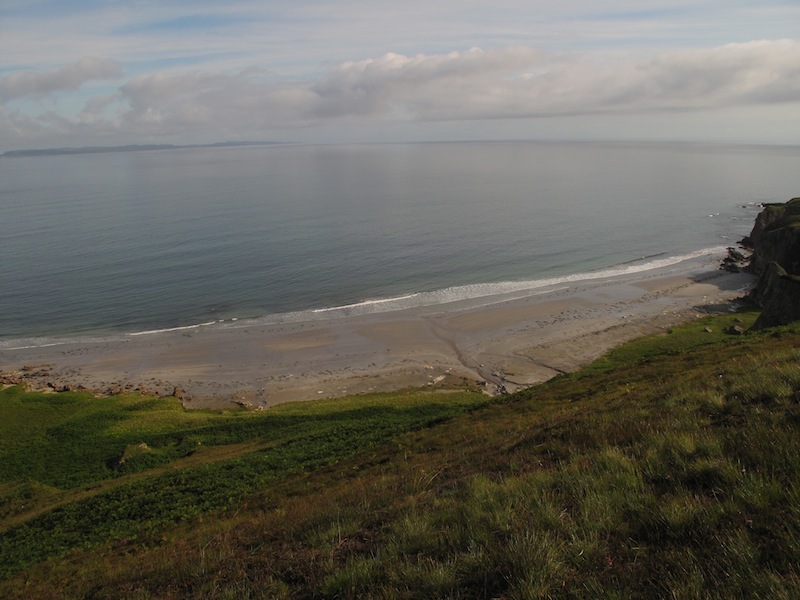 In another life I could spend a summer camped here on the machair, kayaking amid the seals and recording their songs by day, attempting to decipher them by night round the campfire. The still conditions brought with them a small contingent of midges and I walked out onto the shore while I ate a breakfast of porridge, gradually adapting to the realisation that an entire day stretched luxuriantly out in front of me and that I had nothing to do but please myself. I wrestled with the possibilities. 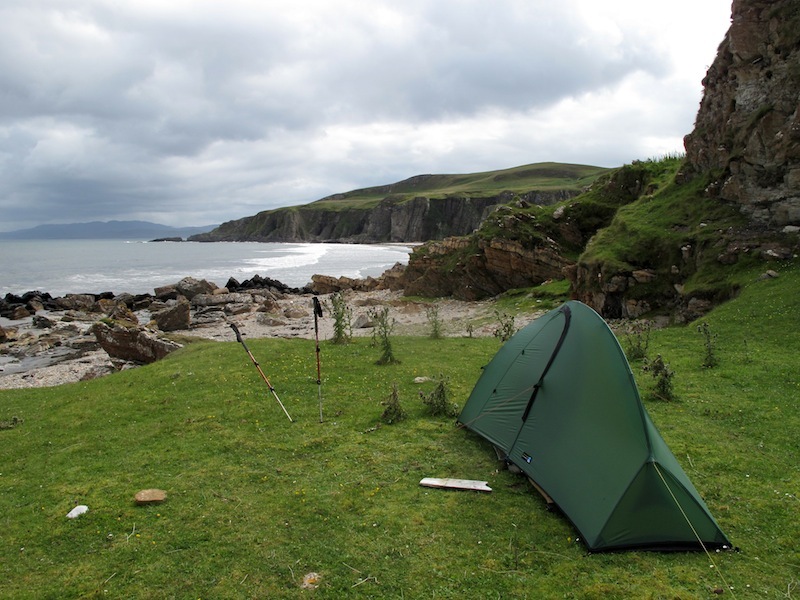 The temptation to pass the day doing no more than mooching round camp was strong but an equal and opposite urge tempted me to strike camp and relocate myself further along the coast. In the end I compromised, packing lunch and setting off on an exploration of the coast. Initially I followed the highly indented coast, scrambling where required on the friable limestone and the more solid rock of the basalt dykes, but progress was slow. Wandering beneath arches into a hidden sea cave I found myself at a dead end and, rather than retrace my steps decided to scramble up and over the arch. As is so often the case I had soon made several moves that I really did not want to reverse. Fully committed I pressed on, hoping not to find my path barred by the impassable or the unjustifiable, all too well aware that should I fall I would lie broken in the geo below for quite some time. No alarm would be raised until I failed to return to my family the following evening. Given the remoteness of my location it would be at least 48 hrs before any search party found me. I pressed on and found that the arch culminated in an exhilarating knife edge. I shuffled across and was glad to step once again onto flat ground. Caves are numerous along this coast, both sea caves and, up on the raised beaches, stranded sea caves. Most are unwelcoming: wet, contaminated with decomposing deer or goats, or both. 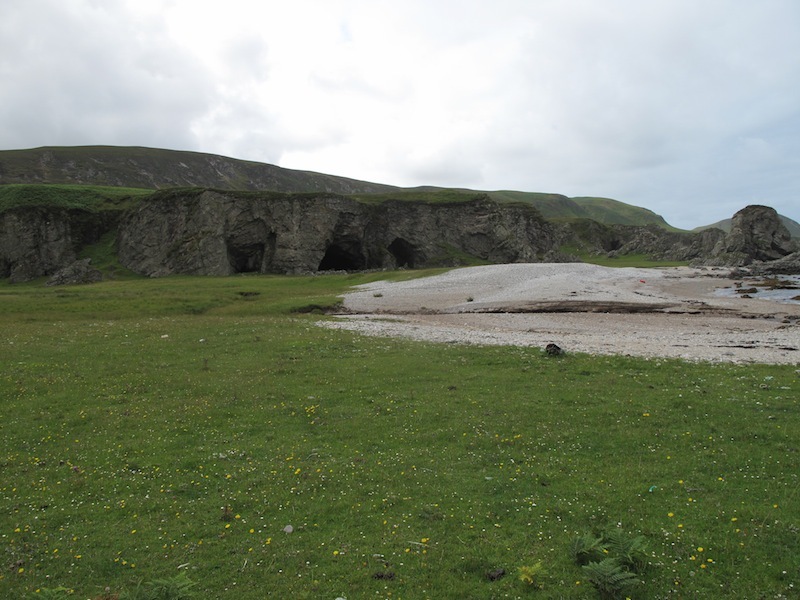 The extensive caves at Port a’ Chotain are an exception, rivalling Uamh Breacan on the north tip of Jura in their extent and dryness, but with superior camping possibilities on the flat grass outside. They are marked on the map using the font reserved for antiquities, past habitation providing a useful guide to present habitability that is worth bearing in mind when plotting cave-dwelling excursions. From Port a’ Chotain I set my sights on the low but prominent hilltop of Mala Bholsa, and struck up from the coast onto the meadows surrounding the ruined farmstead of Bholsa. By the summit trig I brewed coffee, ate my oatcakes and cheese and considered my next move. Further along the coast was another marked cave Uamhan Donna, which I recall reading somewhere had been inhabited in recent times by a woman called Donna and was tempted to inspect. But to get to it would necessitate a descent to boggy ground, so I decided to contour back round to my camp, keeping to the higher, drier ground as much as possible. The going was easy and I was soon back at my camp, chopping driftwood for my evening fire. Next morning, rather than repeat the boggy walk along the sound, I walked back out over the quartzite hill of Sgarbh Breac to Bunnabhainn. 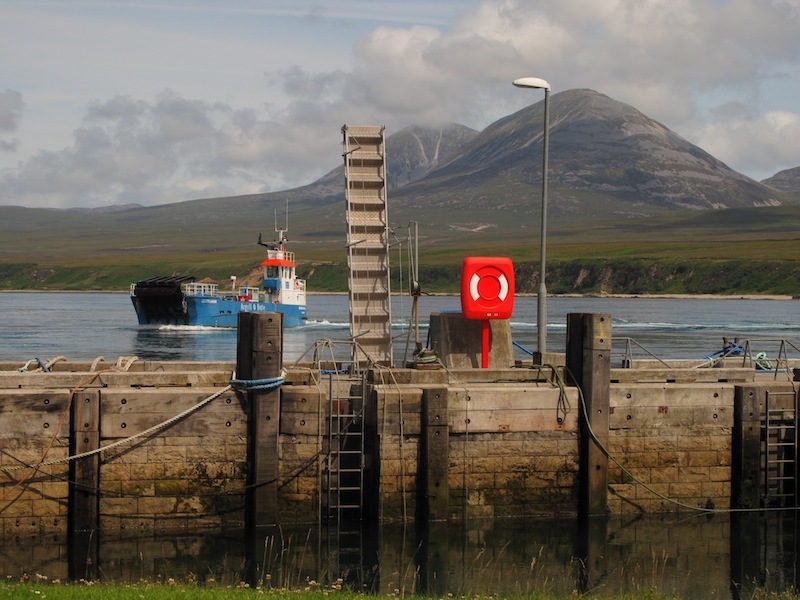 I cycled back to Port Askaig where I enjoyed a pint in the sunshine and watched the clouds clear from the Paps of Jura while waiting for the afternoon ferry. A couple of days of journeying had renewed me, leaving me ready to return to what Chatwin described as the fatiguing monotony of prolonged settlement and regular work.